ArtPrize may only be here for a short time, but local businesses and galleries on the Avenue offer arts programming and community engagement opportunities all year round. To see a full list of Avenue for the Arts businesses open during ArtPrize visit the ArtPrize Map found here. This time of year in Grand Rapids, it’s pretty much impossible to walk three feet without coming face to face with some kind of art. What many people who flock to this city this time of year for ArtPrize may not realize is that art lives and thrives in Grand Rapids for much longer than three weeks. 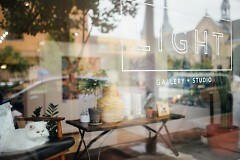 The Avenue for the Arts is home to many galleries and shops currently featuring special gallery showings for ArtPrize. These businesses, which provide year-round arts-focused programming, include: Parliament the Boutique, Dime & Regal, Studio Us, Snowball Studios, and Light Gallery + Studio. We spoke to these Avenue business owners to see how their installations for this special time of year tie into their business mission, goals, and commitment to the arts community. Walking into Studio Us, one of the newer additions to the Avenue, it’s immediately apparent that attention to detail plays a big factor in the business plan of Bree and Ross Tanner. This designing duo specialize in brand identity and user experience, as well as print design and photography. When ArtPrize came around, “we knew that we wanted to work with students, [to do] everything we could to help them have a nice show,” say the Tanners. Unexpected Pleasures is a collaboration with students in Grand Valley State University's Jewelry and Metalsmithing program, featuring the works of undergraduate students. "We want to work with students," they explain. "We’re in a good position to bridge the gap between students and professional world." Driven by a passion to share their experience with students, the Tanners see potential for growth through collaboration. “The Us grows with us,” they explain, and attribute their success largely to their support system, and making connections with students in the community is part of their long term goals to grow as business owners. They also believe that Studio Us brings variety to the Avenue; in addition to housing fine arts for ArtPrize and potentially year round, the Tanners stress that as a design firm, they bring a unique perspective and set of skills to support the other businesses that they now call their neighbors. As far as what being located on the Avenue for the Arts offers to them, the Tanners believe that being a part of something like the Avenue has given them agency to be a larger part of the community. They attend meetings with city staff to discuss things like lighting fixtures in the city, and feel that being residents here, they can have their voices heard and enact change. Welcher also has a collaborative piece on display, created with artist Megan Roach. "As we built the work and installed," explains Welcher, "we considered and discussed a lot about how the space between our own selves and the mediums which we employ is where the idea and perception of the work really reside; how without the air around us to exist and create and perceive within, we would be nothing at all." “We believe with the right push, small starts can become big ideas that snowball into lasting impressions.” This is the mission of Snowball Studios, as told by Virginia Anzengruber, co-founder and executive producer. Specializing in full service marketing including: video production, copywriting, graphic design, website creation, social media management, virtual reality, augmented reality, and motion capture, Snowball Studios has been a facet of the Avenue for the Arts since January 2017. Founded by Courtney Jones in 2015, Dime & Regal was, in some ways, born out of necessity. After being let go from a previous position, Jones started selling hand-made jewelry, scarves, and candles. Moving to the Avenue proved to be a pivotal moment for the success of this small business. Now. 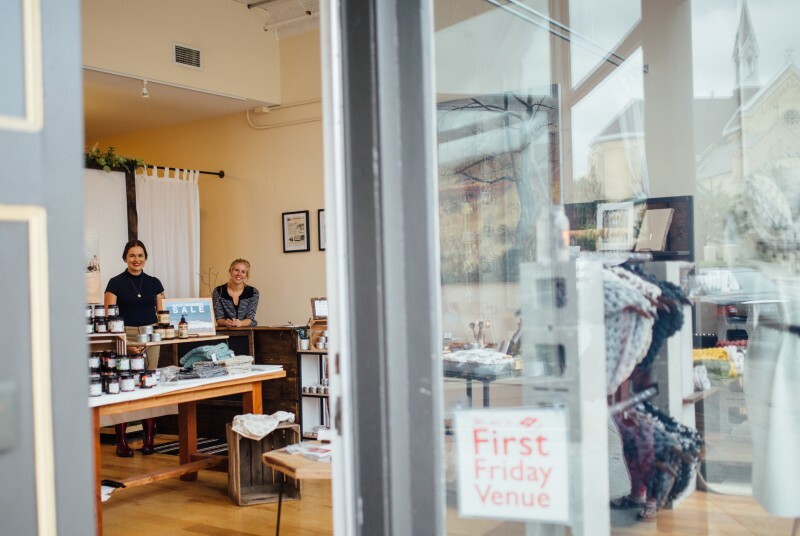 Dime & Regal is owned by two local artists, Jones and Samantha McIntosh, who "want to create an affordable space for emerging artists and designers to connect their products with the community," says Jones. Dime & Regal’s 2017 ArtPrize exhibition, “Growing Sentiments, “grew into its own life,” explains Jones. “Initially I was only going to have my own paintings in the shop, but as I worked, other artists came into play due their close connection to the theme I wanted to work with.” So far, the show has been a success. “The overall response from the public has been heartwarming,” says Jones. “Growing Sentiments” features the works of Bill Hosterman, Hallie LeBlanc, and Courtney Jones. For Dime & Regal, Jones states that being located on the Avenue “has opened so many opportunities.” When Jones first started the business, she participated in a business course offered by the Avenue, which “was a huge help in the initial development.” Additionally, being a First Friday venue and participating in other larger events has helped to grow a local following. “The local support and creative network is something that has dramatically helped our business grow,” says Jones. In addition to being supported by the Avenue, Dime & Regal regularly participates as a First Fridays venue, has been featured on the Tour of Women owned Businesses, Summer Markets, Unstoppable (put on through the GRAM), Break it Down: Make it Better, and “basically anything that the Avenue puts on!” says Jones. Dime & Regal continues to grow and develop from its roots on the Avenue, and will be moving to a new storefront on Wealthy Street this November. Find more info about the grand re-opening here. Light Gallery “does all it can to promote local artists in Grand Rapids,” says Townsley. “It’s our mission to drive sales of artwork, and to share the importance of supporting your local arts community. We currently have over 40 artists who are all from Grand Rapids. 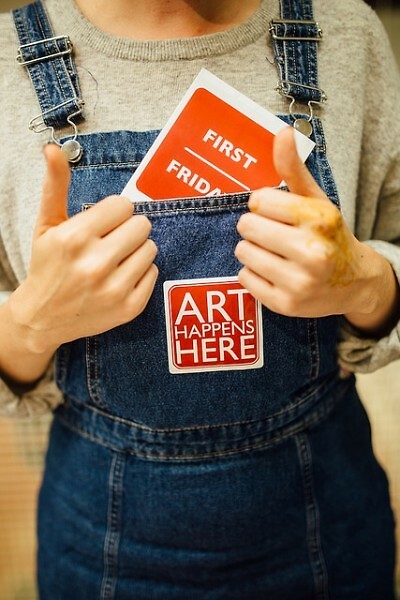 It has been our goal to keep it local, and show the wide variety of artists in our community.” Year round, this space participates in First Fridays, showcasing a new artist each month for the event. They also offer craft-based workshop programming, and are currently planning their Hand Made Holiday workshops, dates to be announced on their Facebook. Currently, Light Gallery + Studio are hosts to ArtPrize installation Rhythm + Repetition, which contains three bodies of work from artists Emily VanderMey of Farmville, Virginia, a team out of X-rite (owners of Pantone), and Chicago-based artist Liz Flores. “All three of our ArtPrize pieces include multiple repeating objects,” they explain. What is the Avenue for the Arts? The Avenue for the Arts is a neighborhood title for the South Division commercial corridor. We are residential, commercial and nonprofit groups working together in a creative community. We are residents in Heartside, and active participants in shaping change in our neighborhood. In 2005, we choose the Avenue for the Arts as a title to represent our commercial corridor and the projects and events that we create. Because the Avenue is powered by volunteers, guest writers create our Rapidian content. Special thanks to Jackie Vega for her contribution of this piece. Jackie is an intern for the Learning Lab at the Avenue, Education Coordinator, poet, would-be librarian, and the owner of too many plants for her own good.